See scan - absolutely perfect. This is an extremely scarce and rare Montenegro Royalty Queen / Princess Zorka Society pin / badge. Presented only to a very limited number of officials and members. The badge is gold plated / gilted and has one of the most beutiful cloisonne multi colored enameling one can see. There is also a full color portrait of the Queen made of painted enamels. Underneath is the Montenegro Royal Crest / Coat of Arms and white eagle and on top of badge is the Royal crown. 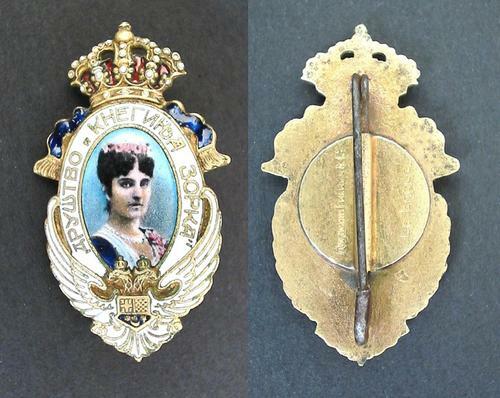 The badge is made by Huguenin Freres in France. Absolutely scarce militaria / military collector piece and one of the rarest Montenegro badges / pins and decorations.